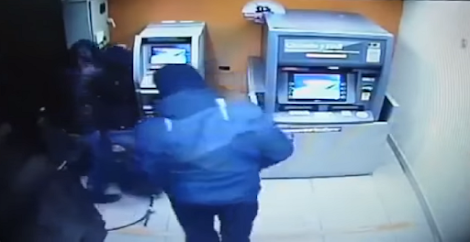 Most ATM robberies end up in a laughable failure. This one, however, was perfectly planned and the execution was flawless. 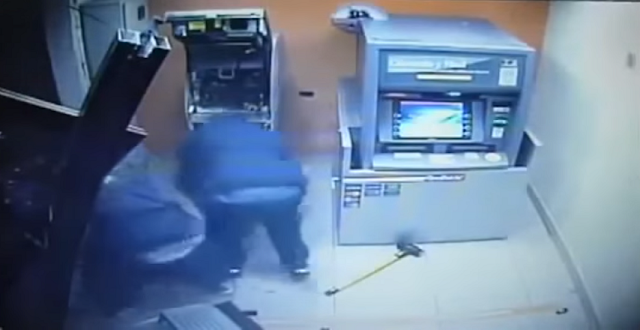 This is the most brilliant ATM robbery ever. They did it in less than 1 minute, imagine that! CCTV footage shows masked men enter the door, though it’s not clear how many there were, there’s likely to be five of them. Some went straight for the ATM machine, while you some stayed at the door, and kept it open. They successfully opened the ATM machine, but because there’s a vault there, it won’t be easy. One of them can be seen holding a hammer and use it in the machine. Later on, they tied something to it. Others went out and only two stayed, the thread they tied was pulled off with such a strong force that the machine was finally opened. I don’t think they’ll get away though, I don’t see gloves anywhere, and they left their hammer right there on the floor.